I love potato chips. I love the aroma, their crunchy look, the feel of the grease and salt on my fingers, and most importantly, the wonderfully crispy, delectable, savoury taste that delights my palate and causes it to crave for more and more. You might assume that if you and I were together at the same dinner or party and there was a communal bowl of chips on the table, that you would soon spot me heaping mounds and mounds of the starchy goodness onto my own personal plate. Or that maybe I would just park myself and stand there the entire night, feasting away from the bowl. This is not so. In this context, potato chips mean almost nothing to me because I have too much social decorum. I also fear that not all my fellow guests have not washed their hands prior to plunging their grubby paws into that same communal bowl. I've used public washrooms before. I notice when people walk out of stalls and don't wash their hands. It scares me. As illustrated by my very scientific graph, the number of people that I have to share my snack with is inversely proportionate to the tastiness of the chips that I'm eating. Don't act so shocked. This isn't the "Experiencing God's Love" graph. God's love is eternal. 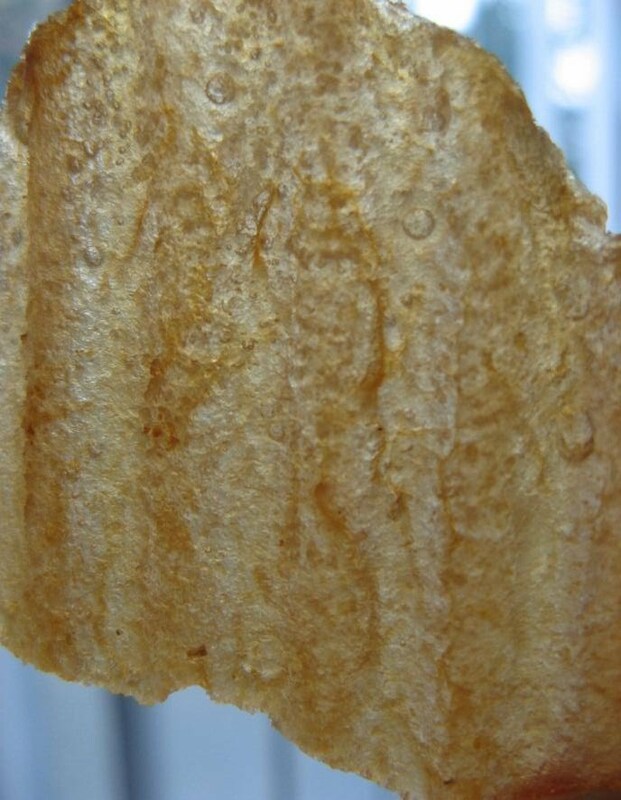 Potato chips are not. I need to eat and savour each chip because each one is precious in my eyes. Even the broken bits and crumbs at the bottom of the bag. I will not cast you aside. People don't know how to appreciate chips like I do. And by people, I mean the dirty ones who don't wash their hands after relieving themselves on the toilet. You can click on it for a high-res version. Here's a close up of the one on the left, as I hold it up against the light. 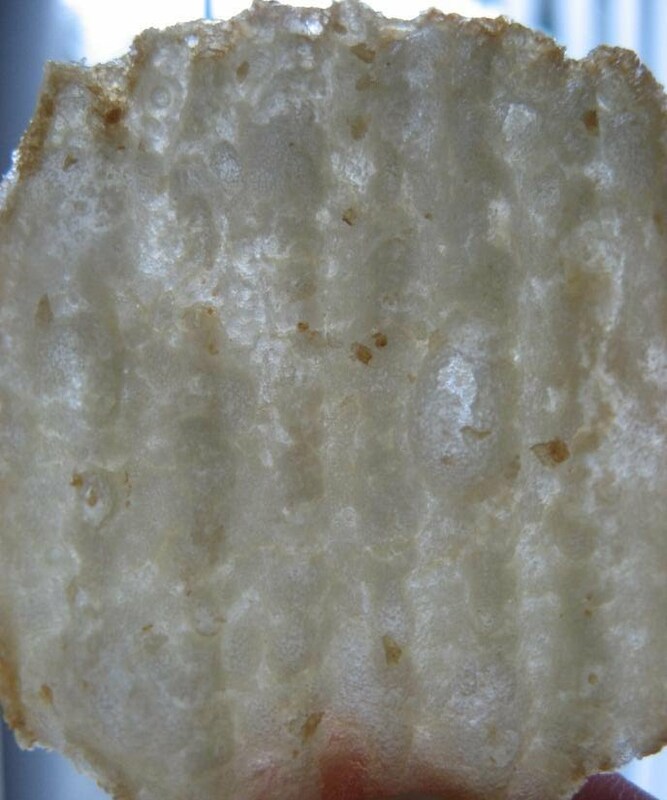 It's a normal chip and predominantly opaque. It tastes very good. 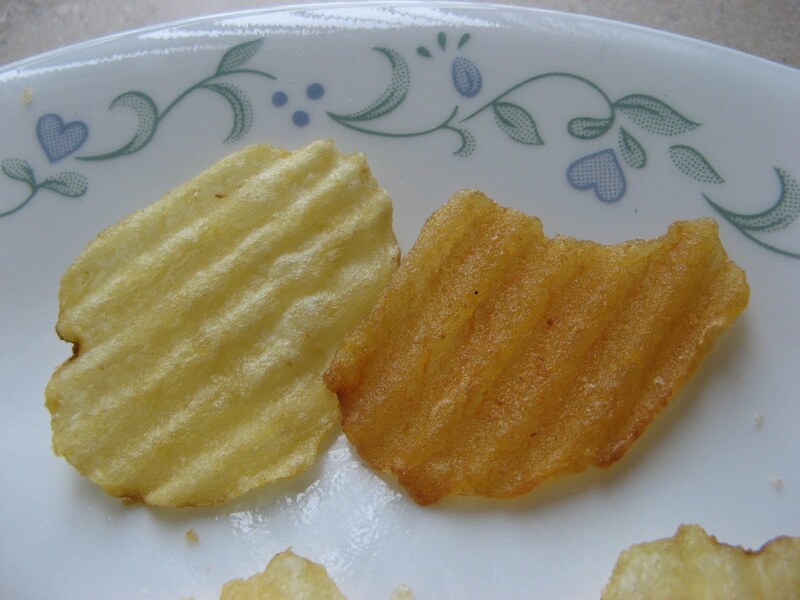 Here's a close up of the chip on the right. It's a super greasy and glorious. This picture doesn't do justice, but it's saturated with so much oil that compared to the other chip, it's translucent. And it tastes DELICIOUS. There are periods in my life when I won't be able to come across any of these super, oily chips for bags and bags at a time. But sometimes, on those predestined and God-ordained days, I might come across one of these chips and I'm just like this guy who found his cheese doodles while trekking around the South Pole (PS- you should watch the video in full with the CC annotations turned on).